Gloria Steinem speaking with supporters at the Women Together Arizona Summit at Carpenters Local Union in Phoenix, Arizona. The National Women's Political Caucus (NWPC or the Caucus) describes itself as a multi-partisan grassroots organization in the United States dedicated to recruiting, training, and supporting women who seek elected and appointed offices at all levels of government. The Caucus offers training, technical assistance, and advice for political candidates, campaign managers, and trainers, with state and local chapters providing support to candidates running at state and local levels by helping raise money and providing hands-on volunteer assistance. 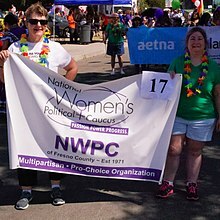 The NWPC was founded on July 10, 1971 to increase the number of women in all aspects of political life – as elected and appointed officials, as judges in state and federal courts, and as delegates to national conventions. On that date, 320 women from all over the United States met in Washington, D.C., to found the NWPC. The founders included Bella Abzug, Shirley Chisholm, Betty Friedan, Fannie Lou Hamer, Mildred Jeffrey, Florynce Kennedy, Jill Ruckelshaus, and Gloria Steinem, among others. The founders elected a national policy council, initially co-chaired by Bella Abzug and Republican Virginia Allan; Allan was the former chair of President Richard Nixon's Task Force on Women's Rights and Responsibilities. At the founding meeting, Steinem delivered an Address to the Women of America, in which she characterized feminism as a "revolution" that meant striving for a society free of racism and sexism; the speech, delivered at the height of the women's movement, became a milestone in U.S. female oratory. The NWPC held its first convention in Houston from February 9 to 11, 1973. The NWPC created a Democratic Task Force in 1974 and a Republican Task force in 1975. The President of NWPC is Donna Lent. The 1st Vice President & Vice President of Communications is Deidre Malone. The Programs Director is Alexa DeJesus. The NWPC organizes campaign workshops across the country to teach the nuts and bolts of running a successful candidacy at all levels of government. The Caucus Political Planning Committee vets women candidates for endorsement and the political action committee raises money to support endorsed candidates with campaign contributions. The Caucus also offers workshops on political appointments and collaborates with other women’s political organizations to promote viable women candidates for gubernatorial and presidential appointments to key posts within the government. ^ "About". National Women's Political Caucus. Retrieved 2017-03-04. ^ "Florynce Kennedy Is an Intersectional Feminist Hero Worth Honoring During Black History Month - VICE Impact". Impact.vice.com. 2018-02-20. Retrieved 2019-04-01. ^ Early History. "History | National Women's Political Caucus". Nwpc.org. Retrieved 2018-12-30. ^ Mills, Kay (April 2007). "Fannie Lou Hamer: Civil Rights Activist". Mississippi History Now. Retrieved 2018-01-31. ^ "Steinem, Gloria". In: Mary Ellen Snodgrass (Ed. ), American Women Speak: An Encyclopedia and Document Collection of Women's Oratory. Santa Barbara, CA: ABC-CLIO, 2017. ISBN 9781440837852. Vol. 2, p. 677. ^ Napikoski, Linda (January 11, 2017). "Gloria Steinem". Women's History. about.com. Retrieved 2017-03-04. ^ "Chronology 1973". The World Book Year Book 1974. Chicago: Field Enterprises Educational Corporation. 1974. p. 8. ISBN 978-0-7166-0474-7. LCCN 62-4818. ^ Castro, Ginette (1984). American Feminism. Paris, France: Presses de Fondation Nationale des Sciences Politiques. p. 200. ISBN 9780814714485. ^ "About | National Women's Political Caucus". www.nwpc.org. Retrieved 2017-06-03. ^ "Staff | National Women's Political Caucus". www.nwpc.org. Retrieved 2017-06-03. ^ Schultz, Jeffrey D. (1999). Encyclopedia of Women in American Politics. Phoenix, Arizona: The Oryx Press. p. 158. ISBN 9781573561310. ^ "Find Your State Chapter | National Women's Political Caucus". www.nwpc.org. Retrieved 2017-06-03. Audiotape collection of the National Women's Political Caucus (U.S.), 1977-2000. Schlesinger Library, Radcliffe Institute, Harvard University. Videotape and motion picture collection of the National Women's Political Caucus (U.S.), 1981-2003. Schlesinger Library, Radcliffe Institute, Harvard University.